Reduce high turnover – Develop training, coaching, and job aids so that, even with high turnover, you can still deliver quality experiences to your Customers. Develop a better approach to Customer Service. 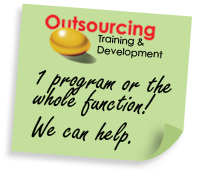 e-Learning, Facilitator-Led, Self-Study training, or any other training format that suits your company's needs.